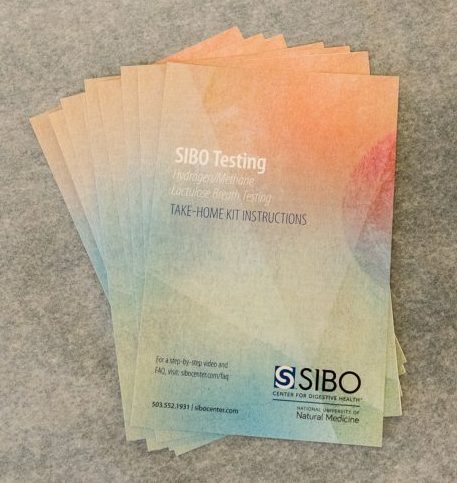 The NUNM SIBO Lab is happy to send free “SIBO Testing” & “What is SIBO?” brochures to your practice. Please send your request to sibolab@nunm.edu. The NUNM SIBO Symposium is an annual conference dedicated to supplying cutting edge SIBO information to practitioners and patients. Past symposium lectures can be purchased here. The NUNM Medicinary at the Lair Hill clinic offers a variety of products that may be helpful for those with SIBO. There is also a convenient online store option. Dr. Sandberg-Lewis is one of the NUNM SIBO Center founders and a SIBO expert. His SIBO interviews, gastroenterology focused articles and book can be found here. Dr. Allison Siebecker’s SIBO page: This website hosts a wealth of carefully curated information about SIBO including SIBO symptoms, associated conditions, treatment options, studies, diets, etc. IBS, SIBO & Mental Health Research: These research papers delve into the links between IBS, SIBO and mental health. Vital Food Therapeutics: This SIBO focused nutritionist offers one on one appointments via the internet. Her website offers up-to-date SIBO information, blog posts and many tasty and simple SIBO friendly recipes with instructional videos. She also wrote The SIBO Diet Plan, which is available on Amazon. Audra T. Lee Integrative Counseling: Audra is a psychotherapist who uses a holistic approach in psychotherapy to support mental/emotional healing for a wide range of adults with various mental health issues, including those living with various physical health issues and functional somatic symptoms. In her private practice, one of Audra’s areas of special interest is the effect of adverse childhood experiences, stress and trauma on the adult development of health challenges, including gastrointestinal disorders such as IBS and SIBO. SIBO SOS: SIBO SOS offers master classes, SIBO summits, recipes, blog posts and other SIBO resources. The Healthy Gut: Rebecca Coomes, of the Healthy Gut, offers SIBO friendly cookbooks, menu plans, recipes, podcast interviews and coaching. SIBO Discussion/Support Group: This is a Facebook page for people who have SIBO. There are a lot of different opinions expressed – we recommend checking in with your doctor regarding treatment options that are recommended by others. SIBO Diet Recipes: This website offers many delicious SIBO recipes. FODY Foods & Casa de Sante: These websites both offer prepared low FODMAP foods including snack bars, spice mixes, soup bases, sauces and more.